More than 52 million Americans participate in a 401K plan with about 515,000 plans across the country. Those plans hold $4.4 trillion and represent nearly a fifth (18%) of the $24 trillion in U.S. retirement assets. 401K funds are truly the life-blood of our retirement savings. It’s too bad these funds are riddled with problems and costs that make reaching your retirement goals nearly impossible. The biggest problem with 401K funds, one that goes almost completely unnoticed is the fact that most funds are completely inappropriate for savers’ needs. The problem is how mutual funds are constructed, based on an index that they follow. For example, a broad market mutual fund might be constructed to track the S&P 500 which is an index of the largest American companies. The S&P index itself is put together by weighting the top 500 companies by size. This means that a huge company like Amazon accounts for 5% of the index while United States Steel Corporation is just 0.000176% of the index. It turns out, your investment in a 401K fund that tracks the S&P 500 doesn’t really track the stock market but depends on the performance of a very few large companies. More arbitrary still is the way other indexes are constructed. Some indexes are constructed using a price-weighted scheme, which means stocks with high prices account for more weight of the fund than low-price stocks. The 3M Corporation at $165 per share is the highest priced stock in the Dow Jones and carries a much higher weight than technology leader Cisco Systems at a price of $27 per share. None of these two ways that indexes are constructed, and by proxy how mutual funds are constructed since they track the indexes, has anything to do with growth or potential for return. Investing your 401K money in these funds is completely arbitrary and ridiculous. The next problem with 401K funds, one that gets more attention than the index problem, is that of high costs in mutual funds. There are a mountain of fees that come with your 401K plan, some from the mutual fund itself and some from your plan administrator. Management expenses as high as 2% are common and mutual funds in general charge between 1.3% and 1.5% in annual expenses. That’s well above the average expense ratio of 0.4% for an exchange traded fund (ETF) which is a type of fund that trades like any other stock. A difference of 1.1% might not seem like much but adds up over time. Besides the high annual fee charged on most 401K mutual funds, many investors are pushed into the funds that benefit their advisor rather than themselves. 401K plans may limit your investment options to specific funds or advisors may just steer you to the ones that pay the highest 12b-1 load fees. Those load fees are commissions paid by the fund back to the advisor and are generally 5% of your investment. You might be investing $1,000 in a fund with a front-end load fee but only $950 will make it into your account after the advisor gets his cut. Back-end load fees are even worse because the percentage is taken off of the original investment amount plus the gains when you sell the fund. Finally, there’s the issue of control in your 401K funds. Besides the limitation to funds that pay the highest commissions to advisors, many 401K plans limit their fund selection simply because the advisor doesn’t want to take the time to discuss the options with clients. They reason that by including broad market funds in the plan, investors have access to everything and don’t need to know about more specific investments. Few 401K plans offer the opportunity to invest in individual stocks, bonds or other assets. While some may allow investment in a precious metals fund, these funds miss the benefits of holding physical assets in your retirement savings. Even if you are able to get your 401K plan to allow investment in a wider range of investments, good luck getting your advisor on the phone to make a trade. By the time your advisor gets around to actually buying the investment, you might have missed out on the opportunity. The solution to the high costs and other problems with 401K funds is…to not invest in 401K funds. That’s not saying don’t take advantage of an employer match on contributions or the tax advantages that come with a retirement plan but using an individual retirement account (IRA) whenever possible. Employer-sponsored plans are great for getting an initial boost from matching but not so great for long-term investment. 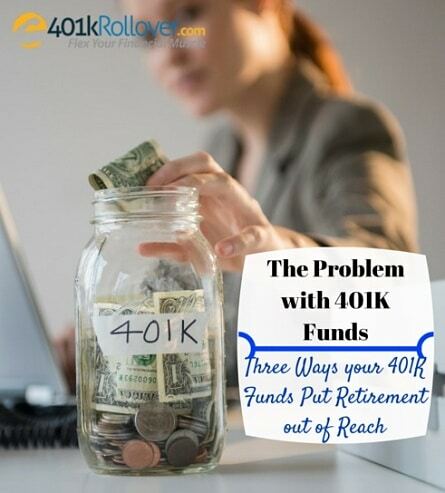 You can get out of the problem with 401K funds through a 401K rollover, always available when you leave your employer and sometimes even available while you’re still working as an in-service 401K rollover. The rollover process is straight-forward and just requires a few forms to avoid 401K withdrawal penalties. When you transfer your retirement savings to an individual retirement account (IRA), you have full control over the assets and how investments are made. 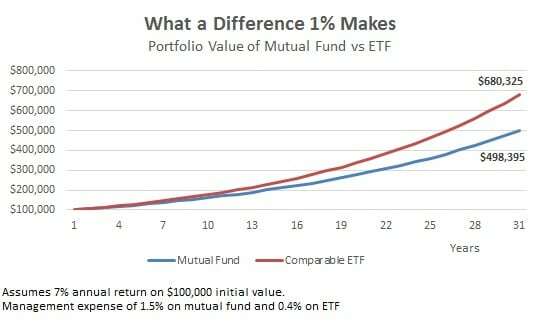 You can invest in individual stocks or other assets as well as in the universe of exchange traded funds (ETFs) which almost always carry lower expense ratios than their mutual fund counterparts. Take control of your retirement planning with an IRA and ditch the high fees and hidden costs of 401K funds.